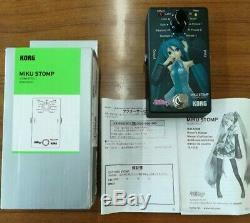 Used MIKU STOMP Hatsune Miku Japan Anime Guitar Effects Unit F/S from JAPAN. Original box and instructions attached. There is no noticeable scratch. Hatsune Miku sings out according to the picking of the guitar. A design that combines the world view of Hatsune Miku with the guitar / effector likeness. International Buyers - Please Note. These charges are the buyers responsibility. 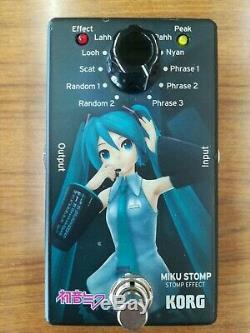 The item "Used MIKU STOMP Hatsune Miku Japan Anime Guitar Effects Unit F/S from JAPAN" is in sale since Sunday, March 3, 2019. 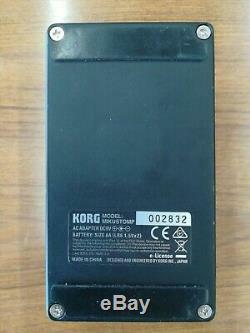 This item is in the category "Musical Instruments & Gear\Guitars & Basses\Parts & Accessories\Effects Pedals\Chorus". The seller is "japanderful" and is located in Tokyo.